Written and sung by Budd Harris. Thing's being dull not long ago with an idea I was hit. I packed my trunk, jumped on a train, arrived all safe .and sound. And having nothing else to do, I thought I'd look around. Now I'll tell you what I saw and heard through the keyhole in the door. he went back on the men that put him there by foul means not fair. Though Grant was thought the worst card in the presidential pack. Of all the plunder that he got he gave his friends a square "whack;"
Expressions like this I heard through the keyhole in the door. 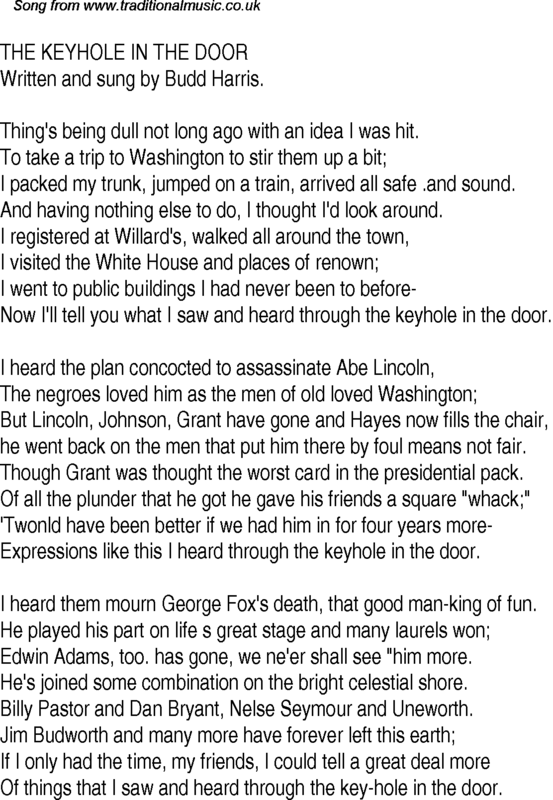 I heard them mourn George Fox's death, that good man-king of fun. Edwin Adams, too. has gone, we ne'er shall see "him more. He's joined some combination on the bright celestial shore. Billy Pastor and Dan Bryant, Nelse Seymour and Uneworth. Of things that I saw and heard through the key-hole in the door.